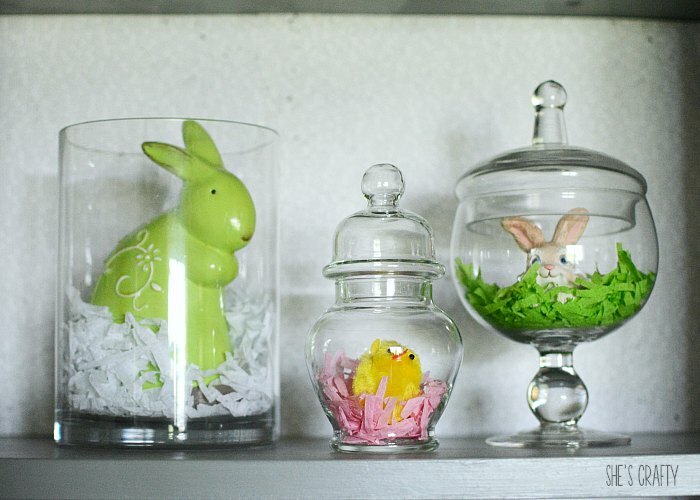 When you think of Easter decorations, do you think of tole painted bunnies, brightly colored plastic eggs and multi colored Easter baskets with plastic grass that gets all over the place? You don't need to! will keep forever and ever. 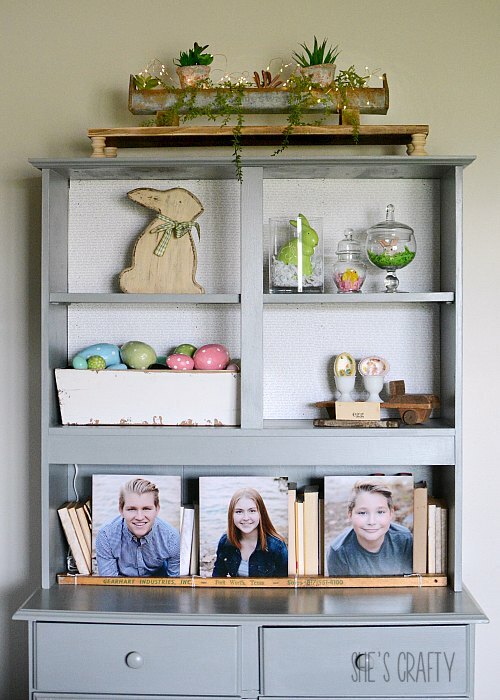 But if that's not your jam, it is possible to easily decorate for Easter without sacrificing your style. 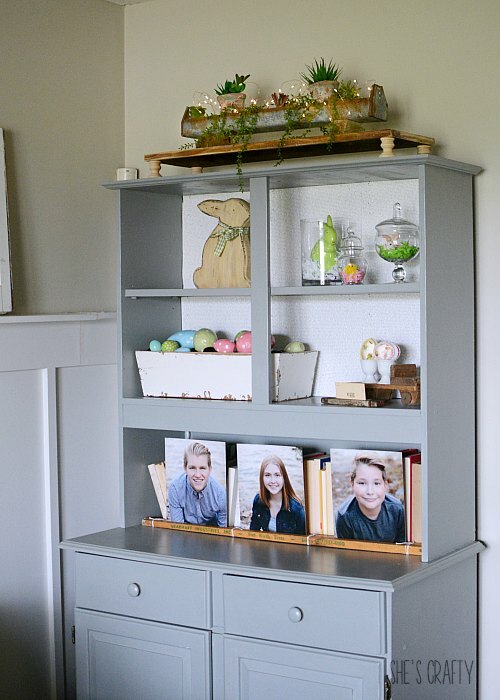 I have a large cabinet, that I bought many years ago at a yard sale, in my living room that is perfect for seasonal decor! It's been painted yellow and black. I pulled the pieces a part for a while and used them in separate spaces in my home. Now I have the piece back together and painted gray. For the back of the cupboard, I used typography scrapbook paper with double stick tape. I love using paper because it's so inexpensive and easy!! And when my decorating ADD kicks in, I can change it out! I filled the bottom of the cupboard with books and then photos of my babes. 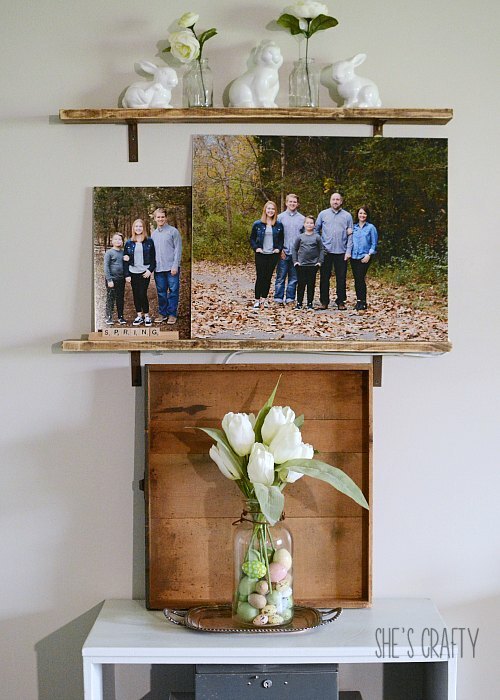 Photos of loved ones are the best decorations of all!! no longer fit my current home decor style, like these little figurines. 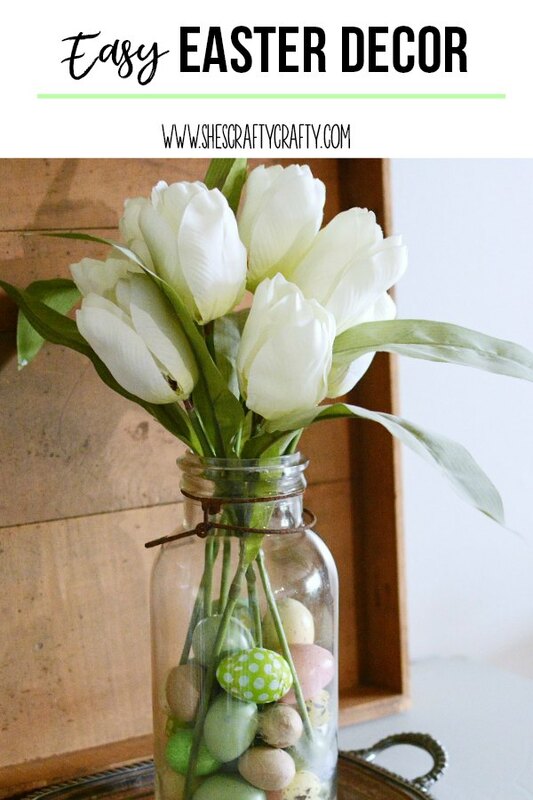 I saw an idea for filling jars from my friend, Leanne Organize and Decorate Everything. She put candy in hers, which I love, but thought it would be better for my sugar consumption to use those figures - I didn't know what to do with- along with crepe paper grass. The yellow bunny is from Home Goods. 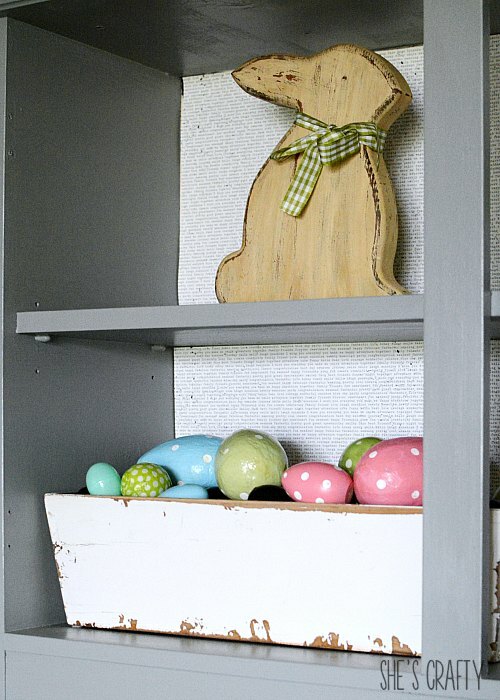 I put a bunch of plastic and chalkboard eggs in a wooden box trough. 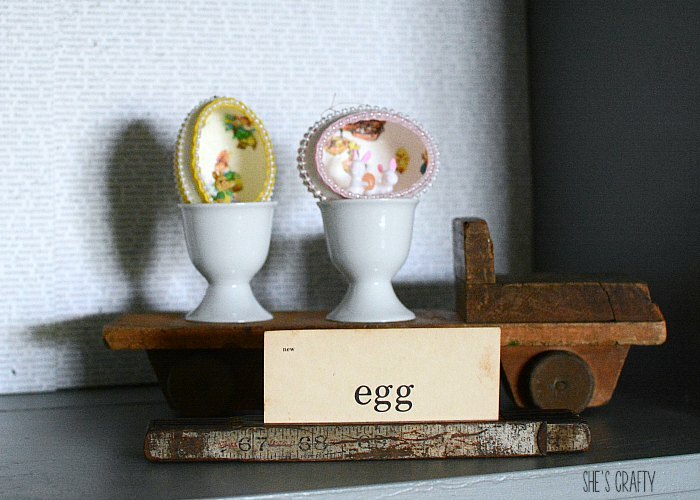 I also added some paper mache' and wooden eggs that I painted with polka dots several years ago. Another view of the entire thing. I found these diorama eggs recently at Goodwill. Aren't they so cute? LOVE! The egg cups are from World Market. I got the truck on a recent trip to a Nashville antique store and the egg flash card last weekend at Vintage Market Days. I still love the vintage chicken feeder succulent holder. Turning on the lights just makes me so happy. This might just stay here forever!! 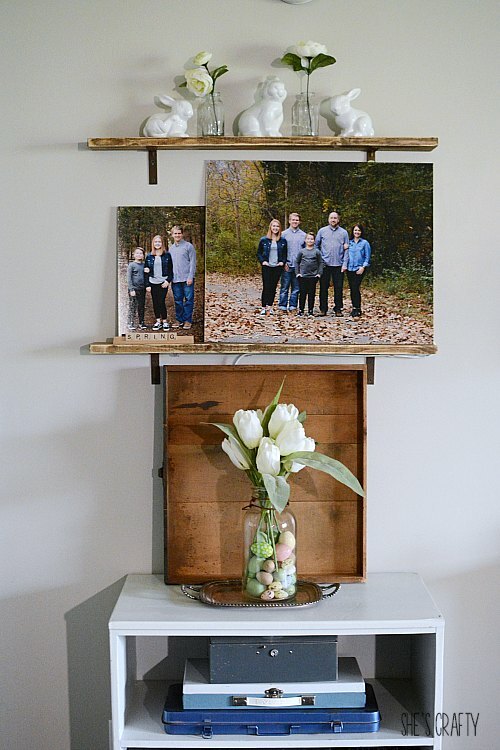 To our picture ledge shelves area, I added some white bunnies. The large one was a scary looking ceramic bunny from Goodwill that I spray painted white several years ago. The small ones are from Target last year. 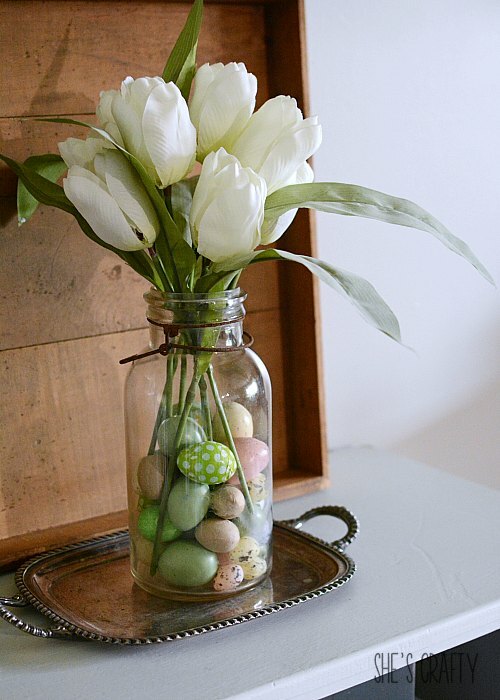 I put some faux decorative eggs in a jar then added some faux tulips as well. 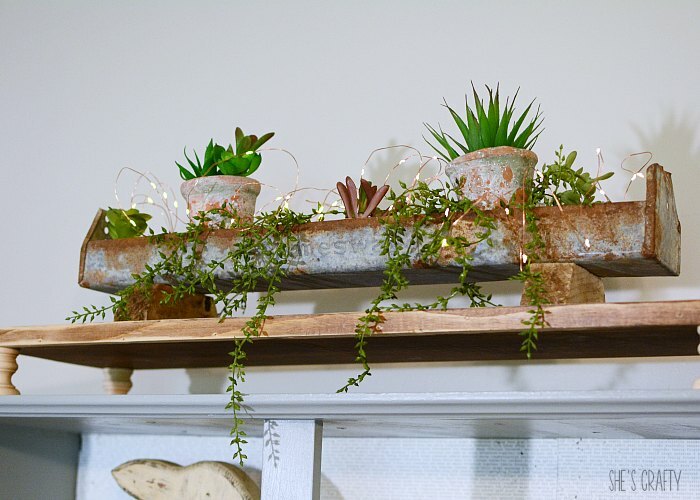 It's so much fun to add small holiday touches to our regular home decor!